I’ve unexpectedly become something of an apologist for the BMW i8. Once near-universally revered for being a futuristic slice of sports car coolness, the hybrid is now on the receiving end of a surprising amount of flack from keyboard warriors across the online automotive landscape. It doesn’t have enough power, some will say. Others claim it needs a bigger engine, and I’ve heard the assertion that it’s just too damn expensive multiple times now. And yet, my admiration for BMW’s second i-branded machine remains. The whole point is it’s not like other sports cars. It’s a car that’s fascinating and intriguing to drive, rather than explosively exciting. If a Jaguar F-Type R is like playing the latest Call of Duty, the i8 is an engrossing game of Hitman. Ignoring the point where you get frustrated and lob your controller across the room. 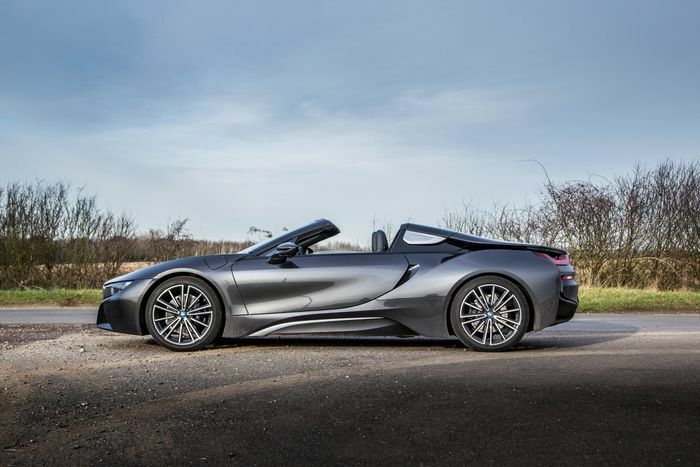 This already appealing prospect of the i8 is now even more alluring because BMW recently added the long overdue Roadster to the ranks. If anything, it’s even more visually striking than the i8 Coupe, thanks in large part to those lovely buttresses just behind your head. The rear seats have been ditched to accommodate the new electric folding fabric roof, which is a shame, but then again, they aren’t much use for anyone over four feet tall. That new roof, by the way, can go up or down in around 15 seconds while you’re travelling anything up to 31mph. The party-piece scissor doors have been retained, you’ll be pleased to hear, but irritatingly, the windows don’t slide into them fully. 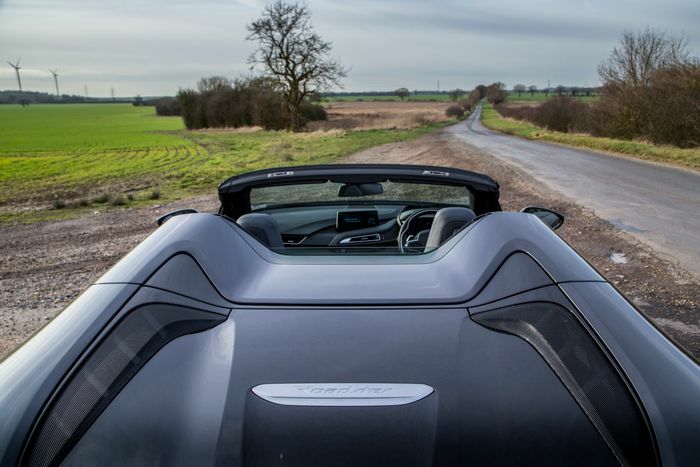 No different to the Coupe, but more irksome in the Roadster since it’s ‘the rules’ that you put everything down at every available opportunity with a drop-top. If you do have the windows plus the rear windscreen/wind deflector up, the i8 Roadster’s cabin keeps you nicely cocooned from the elements. Just don’t expect much in the way of exhaust noise - even without a roof between you and the tailpipes, the main way you’re going to hear the turbocharged 1.5-litre inline-three is via the ill-judged speaker-based augmentation. Which I really wish had an off switch. The mid-mounted, Mini Cooper-sourced engine brings 227bhp to the party, with an electric motor on the front axle adding 141bhp. The total output is 369bhp, making 0-62mph possible in 4.6 seconds - two tenths off the coupe. It never feels hugely quick off the line, but thanks to 420lb ft of torque, brisk corner exits soon become your new favourite thing. The electric boost almost makes up from the inevitable lag associated with extracting well over 200bhp from a dinky 1.5. A 911 would eat the i8 Roadster for breakfast, but in the real world, you really don’t need any more straight-line go than this. It does crash over rough surfaces more than the Coupe, which could be down to the extra stiffening around the windscreen and suspension revisions needed to accommodate the extra 60kg the Roadster carries around. But, it’s still softer than much of the competition, which is one of its greatest assets. Suspension firmness is all well and good, but what use is it on a shoddily-surfaced back road if it makes the car nervous? 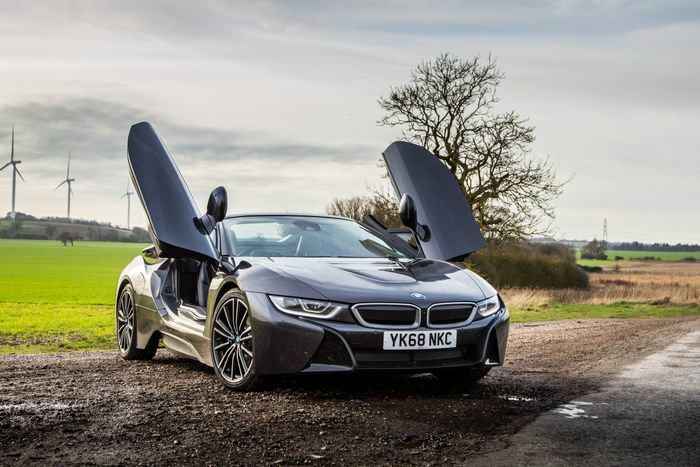 The i8 Roadster doesn’t have that problem - the damping is for the most part very well-judged. 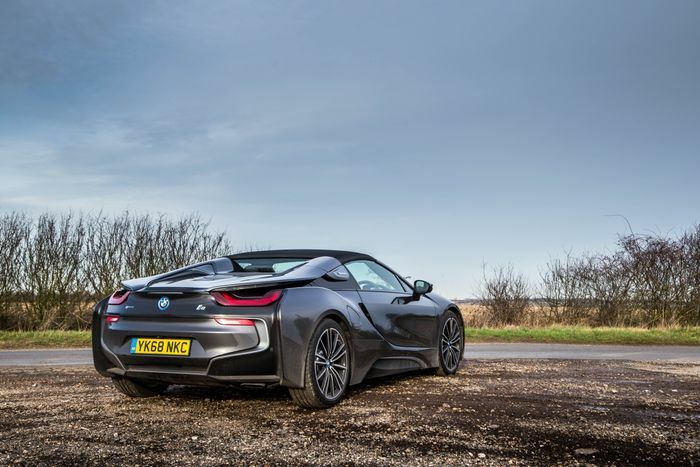 Traction is decent too - the i8 is all-wheel drive by virtue of having internal combustion powering one axle and electricity the other - there’s no physical link between either end of the car. Sounds like it shouldn’t work, but it does. And well. Front-end grip, though, is not so great. 215-width front tyres (you’ll find 245s at the rear) are great for keeping the rolling resistance down and the MPG figure up, but less good when they’re being leaned on in a tight corner by a near-1600kg car. 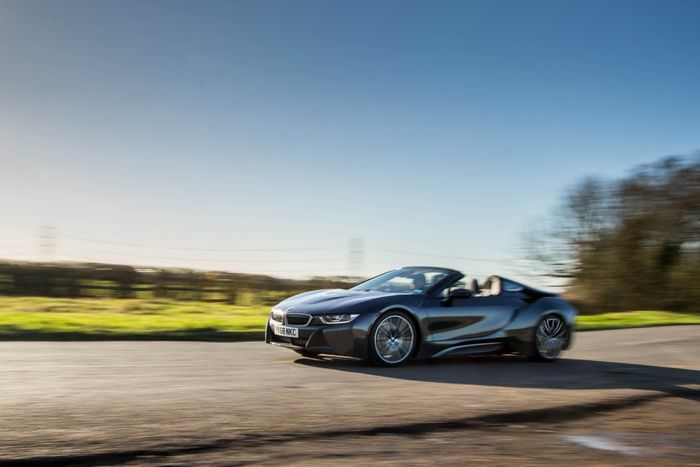 Understeer arrives too easily in the i8, but that’s not the only dynamic criticism I have for the i8 - the steering is almost completely lifeless. Then you have to consider the whole concept of a hybrid performance car - all too often it’s hard to know if you should be using the electricity to help you hyper-mile, or using it to make you go faster. 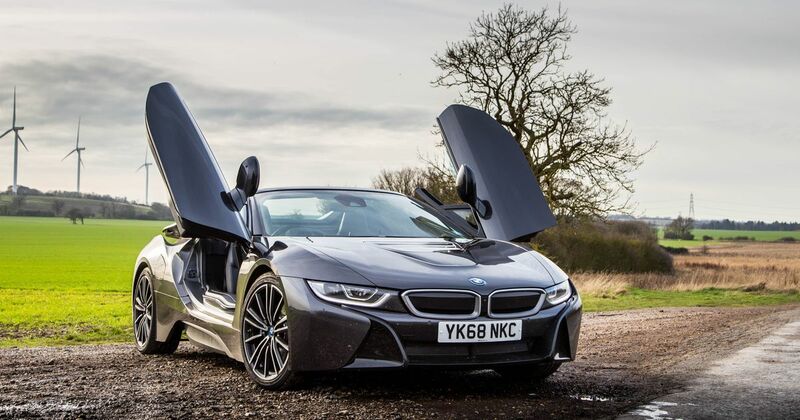 To some extent, it’s as though the i8 Roadster is more of a GT car. But then if it was, it’d actually have some meaningful luggage space, which it doesn’t. This slightly confused identity is hard to stomach when the asking price is £126,200 which, in the case of our test car, had been nudged up to £134,614 with options. You could order the new Porsche 911 Carrera 4S Cabriolet, go nuts on the configurator, and still come up with a smaller figure than that. So is the i8 Roadster pointless? Far from it, actually. It all comes down to circumstance - if you do a lot of lower speed, inner-city miles, the i8 makes a great deal of sense. You could, for example, make the most of the 37-mile electric only range (realistically more like 20) to get to work, plug it in (if your employer is kind enough to let you), and then cruise home in near silence on full batteries. It’s a calming, cost-effective way to travel. Charge it whenever possible, and it’s realistic to be getting over 50mpg on average through mixed driving. 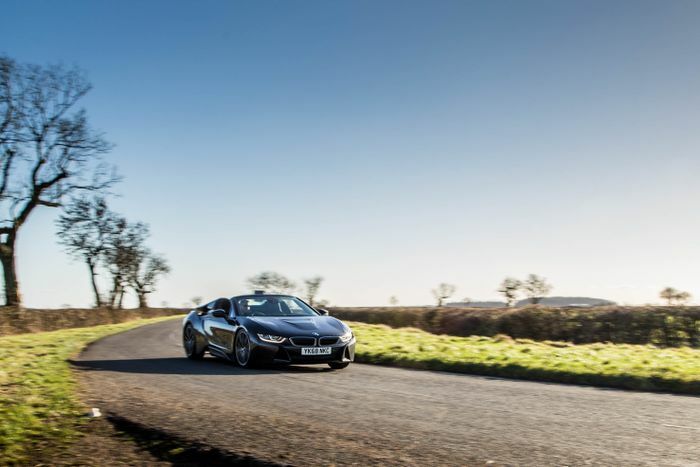 I’ve said as much about the i8 Coupe before, and it’s the same with the Roadster, it’s just that now you can do the same while enjoying the outside world. If, that is, you don’t mind the attention - people still eye up the thing like it’s a supercar costing double or triple the Roadster’s already strong opening price. The i8 doesn’t seem like the future like it once did, as manufacturers - BMW included - increasingly focus on all-electric cars. Indeed, it seems Munich may not even replace it. But I’ll always be glad the i8 happened. And if I was having one, it’d sure as hell be the Roadster.